Based on the three founding principles of Matsuyama University (“Truthful,” “Faithful,” and “Useful”), the Faculty of Economics views internationalization; computerization; integration; and an emphasis on the community, the environment, and human beings as the foundation of education in the faculty. Additionally, the Faculty of Economics takes as its purpose of education the fostering of future financial experts who possess a foundation in economics as well as the abilities to apply that foundation. Further, the faculty is engaged in the cultivation of human resources equipped with problem discovery and solving abilities applicable in today’s complex and diverse society. The Faculty of Economics takes as its objective the cultivation of talented individuals who are able to actively flourish and who are equipped with economics expertise and analytical abilities based on open thinking and rationality demanded by the community, citizens, and the world. In order to achieve this objective, the Faculty of Economics maintains a constant awareness that it is engaged in scholarly education and research which gains insights into and analyzes economic and social phenomena in terms of both efficiency and rightness, gains an accurate understanding of the latest information and knowledge, and engages in highly specialized education and research activities. The Faculty of Business Administration cultivates fully-fledged members of society able to flourish in a variety of fields in the future by equipping students with extensive education and refinement based on the three founding principles of Matsuyama University (“Truthful,” “Faithful,” and “Useful”), as well as through education and research based on business administration studies, business administration information studies, accounting, and commercial science. In short, the Faculty of Business Administration takes as its educational purpose the cultivation of talented individuals, individuals able to flourish in society, who possess knowledge of theory and the abilities needed to apply it backed by extensive education and refinement, and who are also endowed with a broad perspective and appropriate judgement. Through this, the faculty also seeks to provide broad-based contributions to the development of society. In order to realize education based on the three founding principles of Matsuyama University, the Faculty of Business Administration sets as its educational objective the contribution to the cultivation of talented individuals equipped with the three abilities of “problem discovery” (“Truthful”), “problem solving” (“Faithful”), and “communication” (“Useful”). In order to achieve this educational objective, students in the Faculty of Business Administration gain fundamental knowledge through study of a diverse array of educational subjects and, for their professional education, study academic knowledge backed by theory together with practical business matters useful to the operation of a company. The three abilities described above are furthered through means such the classes in the university curriculum and practical exercises. Six specialty courses have been established in the Department of Business Administration in the Faculty of Administration in order to tangibly achieve the faculty’s educational objective. Based on the three founding principles of Matsuyama University (“Truthful,” “Faithful,” and “Useful”), the Faculty of Humanities sets as its educational philosophy the development of talented individuals able to respond to internationalization and new changes in society. The Faculty of Humanities sets as its educational purpose the cultivation of internationally-minded citizens able to flourish in a variety of fields, including the regional community, and human resources able to contribute to the regional community. The objective of the Department of English is the cultivation of talented individuals able to respond to internationalization. Accordingly, the department is engaged in the development of human resources equipped with the English language and communication abilities appropriate to an internationally-minded citizen in this global age. In order to achieve its educational objective, the Department of English aims to foster capable people with surpassing capabilities for working with other cultures, who have acquired practical English communication abilities, gained academic knowledge of Anglo-American literature and culture as well as of English and English education, and who will be able to flourish in the international community. The Department of Sociology sets as its educational purpose the cultivation of talented individuals able to contribute to the creation of a vital civil society – in other words, the fostering of independent citizens equipped with intellectual abilities and independence who will be able to fulfill a central role in civil society. In order to achieve this purpose, the department sets as its educational objective the development of capable persons who have acquired theoretical and practical sociological knowledge, who will be capable of flourishing in a variety of fields in a complex and diverse society, and who are equipped with a sociological imagination and social analytical capabilities. Based on the three founding principles of Matsuyama University (“Truthful,” “Faithful,” and “Useful”), the Faculty of Law sets as its purpose the cultivation of talented individuals equipped with a legal mind who are able to flourish far and wide in society. The world needs people equipped with abilities for finding and solving problems based on a rich humanity and the acquisition of a profound education, people who will introduce appropriate policies and act on them. In response to this challenge, the Faculty of Law sets as its purpose the cultivation of the abilities needed to engage in fundamental thinking from the perspective of legal studies and political science, as well as to create appropriate policies and solutions. The educational objective of the Faculty of Law is the cultivation of healthy, self-directed, and active citizens – in other words, fully-fledged members of society who have attained an advanced education and who possess a fair spirit. More specifically, the educational objectives of the Faculty of Law are as follows. Aim to acquire a keen sensitivity to human rights and the abilities (legal mind) needed for logical thinking and analysis backed by a strong sense of justice. Aim to acquire the abilities needed to think and act for oneself on top of possessing fundamental knowledge concerning both legal studies and political science backed by broad-based knowledge and education. Aim to acquire the abilities needed to work with numerous people to create and execute constructive solutions after discovering problems for oneself and analyzing them from a legal and political perspective. Practical exercises in small groups are held from the first year, and seminar-based learning focused on seeking to draw out student interest and ambition as much as possible is conducted throughout the four years of a student’s education. The faculty also aims to increase the efficacy of students’ learning through surveys, reports, and discussions; as well as to give students presentation skills. The following three courses have been established in the Faculty of Law to enable students to plan for themselves what they will learn in accordance with their future goals and objectives. Students in all courses engage in thorough study of the fundamentals of jurisprudence and political science in addition to learning specialized knowledge and studying a broad array of educational fields. The College of Pharmaceutical Sciences sets as its purpose the cultivation of surpassing pharmacists able to respond to the increasingly sophisticated needs of real-world medicine, together with the cultivation of highly skilled professionals in possession of a broad base of knowledge in medically related fields as well as the practical abilities needed to contribute to human welfare. In order to achieve this purpose, the College of Pharmaceutical Sciences maintains a constant awareness of the fact that it is engaged in scholarly education and research which protects irreplaceable human life. The college also stays up to date on the latest medical and pharmaceutical information and knowledge. In turn, the college engages in surpassing, active education and research activities from a variety of perspectives focused on research into human health. The College of Pharmaceutical Sciences strives for continuing improvement and actively engages in the faculty development activities conducted at Matsuyama University. The college has also established its own Faculty Development Committee in the Department of Clinical Pharmacy which is concerned with pharmaceutical education and research. 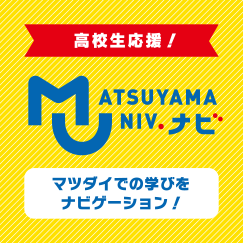 Matsuyama University aims to cultivate citizens equipped with the attitude of the school’s three founding principles – “Truthful,” “Faithful,” and “Useful.” In order to realize this purpose, the university has established General Education Subjects in addition to the specialized subjects in each faculty. The General Education Subjects are comprised of subjects such as Shared Education Subjects, Career Education Subjects, Language and Culture Subjects, and Health and Culture Subjects. These subjects aim to cultivate the qualities described in I and II below. Please use this address for inquiries on this page. To view a document in PDF format, download the free Adobe Acrobat Reader. Please Click the banner and download the application. Copyright © Matsuyama Univ. All Rights Reserved.